Deep in the magnificent Maluti Mountains of Lesotho, you will discover the gem that is Semonkong Lodge. 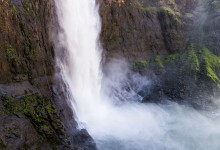 Home to the worlds longest commercial single-drop abseil, it is a top spot for adventure. As registered with the Guinness book of Records, the abseil takes you 204m over Maletsunyane Falls and into the gorge with our experienced guides. The lodge itself is beautiful and cosy using only local stone and thatch, featuring fireplaces and the local Duck ‘n Donkey Tavern on the banks of the river. Experience the wild of Lesotho with Semonkong through overnight pony trails, mountain biking, fly fishing and hiking - all available from the lodge.